The drawn match between Delhi and Assam in the first Ranji Trophy round in New Delhi ended in controversy over a slow last hour. Delhi fell 30 runs short of securing an outright win, and their coach KP Bhaskar pointed to bad light and Assam's alleged slow tactics as factors in the eventual result. Delhi needed 79 in 14 overs, but were stranded on 49 for 2 with Assam bowling only eight overs in the last hour. Bhaskar has ruled out lodging a formal complaint, but admitted the opposition were astute in tackling the situation while remaining within the laws. Guwahati is the largest city of Assam and Northeastern India, a major riverine port city on the banks of Brahmaputra River. The ancient cities of Pragjyotishpura and Durjaya (North Guwahati) were the capitals of the ancient state of Kamarupa under the Varman and Pala dynasties. The Guwahati region hosts diverse. Today, Assam Cricket Association’s Stadium at Barsapara in Guwahati made its debut holding International T-20 match between India and Australia as Assam Chief Minister Sarbananda Sonowal had inaugurated the stadium. 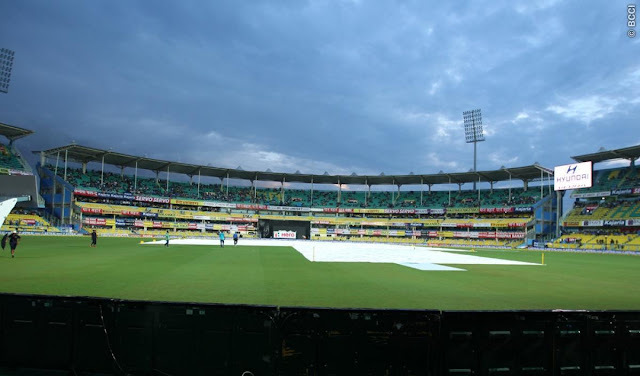 The state-of-the art stadium has been built at a sprawling 59 bighas of land which has all the modern facilities and tipped to be one of the best in the world. Health Minister Himanta Biswa Sarma who is also the president of ACA was present at the stadium alongwith host of other dignitaries. The foundation stone of the stadium was laid by then Chief Minister Tarun Gogoi in June 2004. On 4 November 2012, the East Zone Senior Women's Interstate One-day Championship match between Assam and Odisha became the first match to be played at the ground. In the 2013-14 Ranji Trophy season, the ground hosted four matches. Assam against Kerala was the first first-class match. Though not so stated in Wikipedia, it is reported that the stadium is also known as Dr. Bhupen Hazarika Cricket Stadium. Late Bhupen Hazarika was an Indian playback singer, lyricist, musician, singer, poet and film-maker from Assam, widely known as Sudhakantha. His songs, written and sung mainly in the Assamese language by himself, are marked by humanity and universal brotherhood and have been translated and sung in many languages, most notably in Bengali and Hindi. He received the National Film Award for Best Music Direction in 1975. Having been a recipient of many awards, he was posthumously awarded Padma Vibhushan, India's second-highest civilian award, in 2012. On a pitch that seemed moist and soft underneath, David Warner asked India to bat first. Dew was expected to be a concern later in the night, but another left-arm bowler with good pace and the ability to swing the ball, Jason Behrendorff damaged India with 4 wickets at the start from which India never recovered. The target of 119 was hit with ease after fall of David Warner and Finch as Moses Henriques and Travis Head scored the runs with ease.